Making your own reindeer is a suitable holiday crafts project for Christmas tree ornaments, house decorations or gifts, using this plan adapted from allfreecrafts.com. You can make a team of reindeer if you wish to represent the famous animals that pull Santa's sleigh. The materials you have to buy are minimal; you probably have the majority of the items around the house or can find them nearby. Cut the tree branch into two pieces with the saw: One piece should be 2 to 3 inches long, the other 1 to 2 inches long. Cut four 2-inch pieces from the dowel. 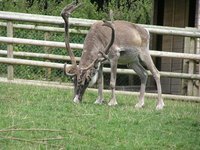 Using the longer branch as the reindeer's body, mark spots with a pencil where the four legs will go. The two front legs and the two back legs must be opposite each other. Bore a hole into each of the four pencil marks with your awl. Test a piece of dowel in each one and make adjustments as needed. When they fit, dab a drop of glue on one end of each dowel and place one piece in each hole. Using the smaller piece of tree branch as the head, mark where you want to connect it to the neck. Bore a small hole into the piece of tree branch with the awl. Cut a piece of dowel about 1 inch long for the neck of the reindeer. Insert the dowel into the hole you just made, making adjustments as necessary. Dab a drop of glue onto one end of the dowel and insert it into the hole. Pencil in another mark on the body of the reindeer representing where you want the neck to connect to the body. Drill another hole with your awl. Insert the "neck" of your reindeer into the hole you just made to check the size. When it fits, add a drop of glue to the other end of the dowel and insert it into the new hole. Allow to dry. Draw eyes on the front of the reindeer's face. Glue a red bead to the face as the nose. Glue a small pom-pom to the back of the reindeer's body as the tail.